No interpreter is needed to enjoy Taiwan’s gorgeous mountain scenery, and the island’s culinary delights excite the palate even if you can’t speak a word of Mandarin. Getting to grips with Taiwanese opera is far trickier, however — and not just because it’s performed entirely in the local language known as Minnanhua or Taiwanese. bravery. Operas are performed to the accompaniment of traditional instruments, such as three-stringed banjos, four-stringed lutes, and bamboo flutes. Gongs and drums punctuate dialog and provide cacophonous backing for the sessions of acrobatics that represent combat. In 21st-century Taiwan, Beijing opera is confined to a handful of high-brow venues. By contrast, Taiwanese opera can be found in temple forecourts and small-town parking lots. Those who travel around Taiwan may well stumble across a Taiwanese opera in full swing, part of the celebrations for a deity’s birthday. Les Isles is the relaunched inflight magazine of UNI Air. The complete article (which is pretty short) can be read online here. The first time I experienced the Neiwan Branch Railway was on another assignment for Travel in Taiwan, nearly twenty years ago. I thereafter rode the train to Neiwan once more, but that was long before the line’s closure, renovation and reopening in late 2011. So when the magazine asked me if I’d like to go back, my eagerness to see if the area had changed spurred immediate acceptance. On a glorious sunny day, with an unusual spring in my step, I walked from Hsinchu High-Speed Railway Station to the adjacent Liujia Station, which is operated by Taiwan Railway Administration (TRA). The construction of Liujia Station and 3.1km of new tracks was a key reason for overhauling the Neiwan Line. Commuters can now get from the HSR stop to the heart of Hsinchu in just 19 minutes. Before boarding the dian-che (電車, “electric car”) to Hsinchu, I bought a one-day, jump-on/jump-off ticket valid for both the Neiwan and Liujia lines. These passes (which cost NT$95 for adults, NT$50 for kids and senior citizens) can also be purchased at Hsinchu TRA Station and some other stations, including Taipei. Sightseers heading straight to Neiwan should get off at the next station, Zhuzhong (竹中), and make sure they wait on the right platform. If you’re heading into the city from Liujia, as I was, there’s never any need to change trains. The complete article is in the November-December issue of Travel in Taiwan. This year I've been traveling frequently to the eastern counties of Hualien and Taitung to write about places and attractions chosen by the East Rift Valley National Scenic Area Administration. Perhaps my favorite has been the bicycle trail between Yuli and Fuli, but Ruisui (the first time I rode an electric scooter) was also fun, and I'm always happy to write about Japan's architectural legacy in Taiwan. 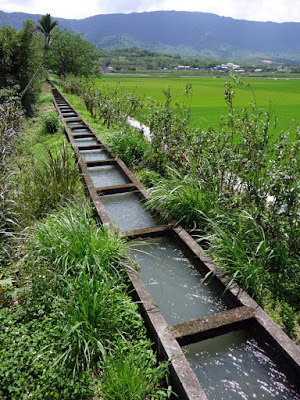 All of these articles, and several more about the East Rift Valley, are on my Bradt Taiwan blog. I had done a bit of research about Sarawak laksa before arriving. Not that I was any the wiser. Depending on who you believe, the most authentic pastes have 20, 30, 36 or even more components, among them garlic and lemongrass, as well as various spices. It’s often said the first laksa vendor in Sarawak—a Malaysian state on the northwest coast of Borneo—was a Cantonese man who moved to Kuching from Indonesia at the end of World War II. He gave or sold his recipe to a Cantonese lady, who may or may not have passed it to a Mr. Tan who, in the 1960s, made a fortune selling factory-made “Swallow” brand laksa paste. None of these creation myths mention the other forms of laksa eaten in Malaysia and Indonesia. Mr. Tan’s product—and those of the imitators which soon appeared (one called itself “Eagle,” another “Parrot”)—made preparing laksa at home a great deal quicker and less laborious. Inevitably, it was a huge hit among Sarawakians living far from their home state. The published version of this article is quite a bit shorter than the piece I sent in. In the original I made some references to Taiwan, comparing its so-far frustrated efforts to ensure its autonomy/independence, to Sarawakian discontent with the political status quo in Malaysia. To read the complete published article, go here. Once you know a spine of lofty mountains runs almost the entire length of Taiwan, the island’s rail map makes complete sense. The busiest stretch of railroad runs from the northern port city of Keelung, through Taipei and then southward to the cities of Taichung, Tainan and Kaohsiung. Near Keelung, another line goes east en route for Hualien and Taitung. The rail system didn’t go all the way around the island until 1991, when the completion of 36 tunnels and 158 bridges in the space of 98km finally made it possible to ride a train from the southwest to the southeast. Look more closely at a rail map of Taiwan, and you’ll notice that, while no railroads go across the middle of the island, a handful of branch lines do penetrate the interior. The best known of these is the narrow-gauge Alishan Forest Railway, which climbs from 30m above sea level in Chiayi City to an altitude of 2,216m. Taiwan’s other branch railways share the same gauge (1,067mm or 3 ft 6 in) and rolling stock as the main line. Instead of linking major urban areas, they provide access to more bucolic corners of Taiwan. Rather than carry commuters on weekdays, they shuttle sightseers from one quaint little town to another. Business or family commitments keep many foreign visitors close to Taipei, so we’ll start in the north. From downtown Taipei, it’s possible to get to Ruifang – where the fun really starts – in around 45 minutes. There, travelers can buy a day-pass for the Pingxi Line and begin to explore. This 12.9km-long spur was built so the area’s seams of coal could be more easily exploited. Mining dominated the local economy between 1918 and the 1980s. 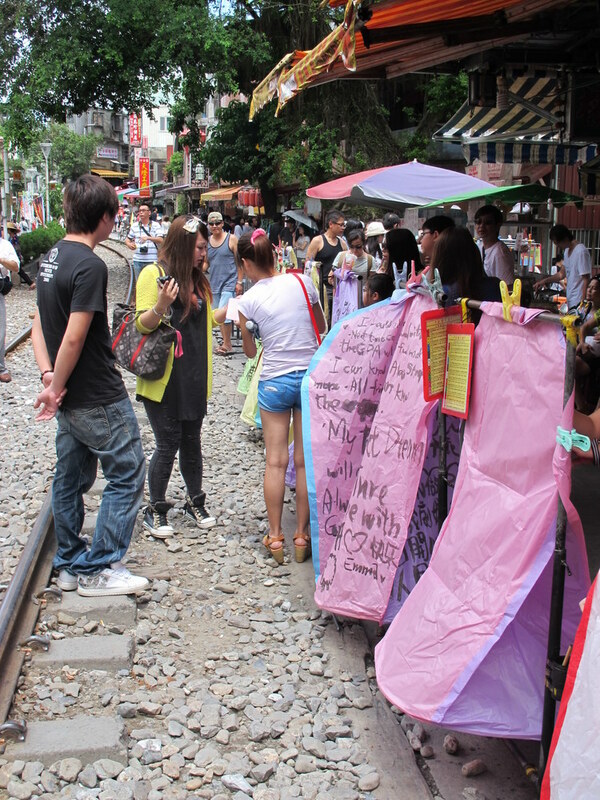 Since then, trains have transported tourists eager to view rugged landscapes, visit the impressive waterfall at Shifen, or launch sky lanterns at Pingxi (where I took the photo here). Painting your wishes on the side of a lantern (a wire frame covered with paper, and propelled upwards by the heat of the wick burning inside) then watching it float into the distance is very much the done thing. To read the complete article, get a copy of the August issue of En Voyage, EVA Air's inflight magazine. North-south travel is a cinch, but those who hope to take a bus between Taiwan’s western plains and the east coast have very few options. On the western side of the Northern Cross-Island Highway (Highway 7), buses only go as far as Lower Baling. Each day, there are three services from Daxi, one from Taoyuan, and one from Zhongli. On the eastern side, Yilan-Lishan buses (two services per day in either direction) stop at Baitao Bridge, the intersection of Highway 7 and Highway 7甲. The distance between Baling (a popular place for "herping") and Baitao Bridge is just over 39 kilometers, so walking from one to the other is hardly feasible, even though the scenery is excellent. The complete article is online, right here. Sheltered from the busy, populous parts of Taiwan by massive mountain ranges, Taitung County is a charming rural part of the island where life is slower, the fields seem greener, the air fresher. This is a region where you want to slow down, rewind, take a deep breath, and regain your energy. The TRA’s bilingual website is a good place to start. You can not only ascertain departure and journey times, destinations, and fare prices, but also pull up a complete list of trains stopping at a particular station. To read the complete article, get a copy of the July/August issue of Travel in Taiwan, or go to this webpage. A blog for aspiring freelancers - Anyone interested in travel writing or freelance writing may want to take a look at the blog I've created to publicize my workshops.